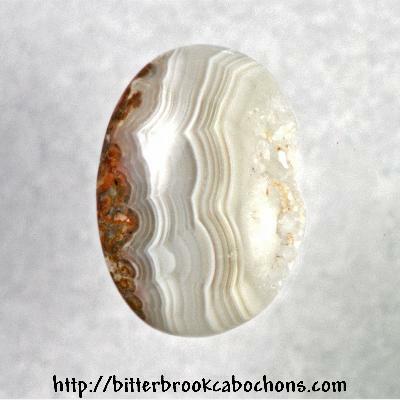 This Lace Agate oval cabochon was a class demonstration in thinking outside the box. The right side is "open" with exposed crystals. 29mm x 21mm x 5.5mm. Weight: 24.60 carats. Do you like Lace Agate Cabochons? Click here to see all of the Lace Agate Cabochons on the site!